If you haven't watched any of the World Cup this year, you might not know what a vuvuzela is. 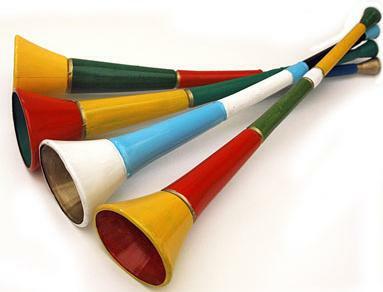 Basically the vuvuzela is a plastic horn that produces a loud buzzing noise which irritates much of the World Cup viewing world. Personally, I love it. I downloaded the vuvuzela iPhone app and blast it at my grandpa while he watches Jeopardy. Totally throws him off of his game. Aside from myself and the South African locals, most people hate the vuvuzela. The Yankees seem to be no different. When "bleacher creature" Anthony Zachariadis wailed on one of the plastic horns at Tuesday night's game, Stadium security snatched it out of his hands. "You gotta give me the horn," the guard told him, inducing a chorus of boos from the bleachers. "You can't blow it." Zachariadis finally agreed to leave the game in return for not having his horns seized. "I have been tossed from that place hundreds of times. Many times I even deserved it," he said. "But this was ridiculous." That seems a little excessive but I'm a professed vuvuzela lover. 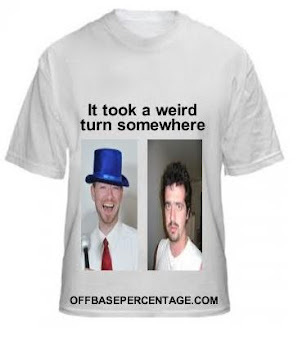 Which reminds me, I need to go buy some online before Obama makes them illegal in the United States. That guy seems to have way too much time to watch sports. I have to respect Zachariadis for taking the ejection instead of giving up his vuvuzelas. That's dedication to his obnoxious craft. Well played, sir. Luis Gonzalez To Get Number Retired. Wait, What? Strasburg Versus, Um, The Royals? Did You Hear That Strasburg Pitched Tonight?